The Reptile Report - Albinoturtles.com shows off a stunning yearling holdback albino pink belly turtle that they produced. 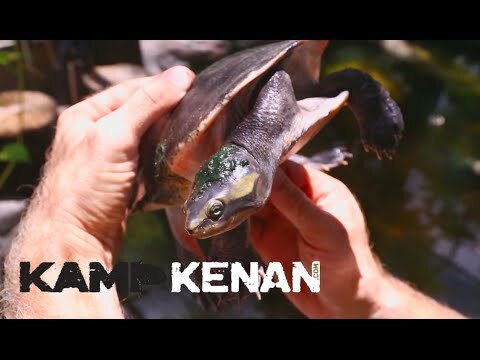 YouTube - Kenan Harkin shows us some of the beautiful pink belly sideneck turtles that live at Kamp Kenan and tells us how he keeps them. TortoiseForum.org - This male albino stinkpot turtle flaunts the traditional color/gender roles and proudly displays a brilliant pink coloration. Reptiles Canada - Take a look at the fabulous bright colors of a gorgeous yellow belly hypo ball python produced by Jonathan Leone. Bush League Breeders Club - Check out the dark colors and clean pattern on this acid belly ball python produced by J-Royals Reptiles. Reptile Insider - A gorgeous Euro Mandarin belly pastel boa constrictor produced by Hans Winner flaunts its lovely coloration for the camera at Designer Boas.